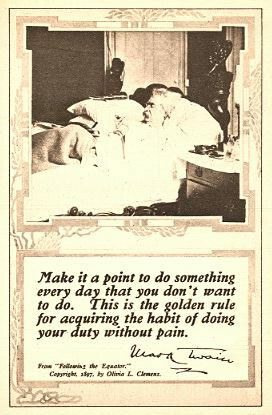 Pure and simple, I love Mark Twain. He makes me laugh at myself and the world around me. He showed us a different way to think about life and goodness and most of the things we take for granted in this world. Twain is an American folk hero and I will endeavor to live the remainder of my life as he once was quoted. What a good thing Adam had–when he said a good thing, he knew nobody had said it before. It pleased me beyond measure when Yale made me a Master of Arts, because I didn’t know anything about art…I rejoiced again when Missouri University made me a Doctor of Laws, because it was all clear profit, I not knowing anything about laws except how to evade them…And now at Oxford I am to be made a Doctor of Letters–all clear profit, because what I don’t know about letters would make me a multi-millionaire if I could turn it into cash. 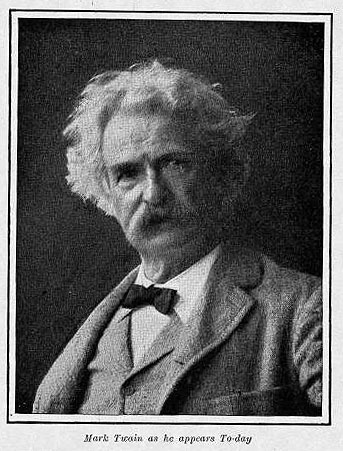 Samuel Langhorne Clemens, for nearly half a century known and celebrated as “Mark Twain” was born in Florida, Missouri, on November 30, 1835. He was the foremost American philosopher of his day; the world’s most famous humorist of any day. During the later years of his life he ranked not only as America’s chief man of letters, but likewise as her best known and best loved citizen. Mark Twain’s work was always of a kind to make people talk, always important, even when it was mere humor. Yet it was seldom that; there was always wisdom under it, and purpose, and these things gave it dynamic force and enduring life. Some of his aphorisms, so quaint as to invite laughter, are yet fairly startling. His paraphrase, “When in doubt, tell the truth,” is of this sort. “Frankness is a jewel; only the young can afford it,” he once said to the writer, apropos of a little girl’s remark. His daily speech was full of such things. The secret of his great charm was his great humanity and the gentle quaintness and sincerity of his utterance. His understanding of subjective human nature was simply amazing. Such knowledge he acquired from himself. He recognized in himself an extreme example of the human being with all the attributes of power and of weakness, and he made his exposition complete. The world will long miss Mark Twain; his example and his teaching will be neither ignored nor forgotten. Genius defies the laws of perspective and looms larger as it recedes. Mark Twain’s memory remains to us a living and intimate presence that today, even more than in life, constitutes a stately moral bulwark reared against hypocrisy and superstition–a mighty national menace to sham.